Quakertown, PA, November 2, 2009 – ASCO® offers a broad range of popular valves used in intrinsically safe (IS) and explosion proof (EX) installations. Now PneuMagnetic, a manufacturer of valve operating solutions and solenoid valve actuators, offers a line of unique actuators which can be effortlessly retrofitted to ASCO® valves, with resulting installation savings of up to 50%. ASCO®'s EX and IS valves are used in a variety of hazardous environments, from oil refineries to bakeries. The PneuMagnetic Actuator converts most ASCO® direct-acting solenoid valves from electric to pneumatic operation. "Typical valve actuators are both expensive to install in hazardous environments, as well as being relatively costly to maintain," according to Robert Altonji, President of PneuMagnetic LLC. "Direct acting solenoid valves require wiring and conduit installations which can quickly amount to several times the cost of the valve. The PneuMagnetic Actuator achieves dramatic reductions in installation cost simultaneous with improved reliability. This is accomplished by converting the valve to pneumatic operation." The user will realize savings by eliminating the need for bringing electricity into the hazardous environment. This eliminates the need for field wiring, conduit and junction boxes, flame arrestors or barriers and expensive IS valves as well as the labor to install them. Valves converted to PneuMagnetic require only an inexpensive air pilot using a flexible, small diameter pneumatic line. 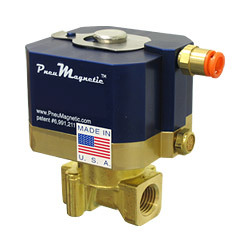 A complete list of ASCO® valves which can use the PneuMagnetic actuator is available at: http://www.pneumagnetic.com/ASCO-solenoid-valve-coils.html. Many valve models from ASCO®'s 8320 series and 8262 series are included.